Follow our news and in particular read and download the Firm Newsletters consisting of a selection on a regular basis of material and case law in economic law. 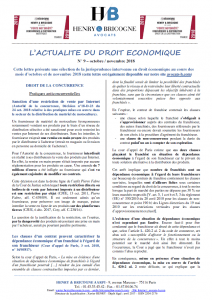 Les Echos Solutions Website publishes an legal article of our law firm: “Clauses of a contract can show the economic dependance of a franchisee vis-a-vis the franchisor” (11 April 2019). This entry was posted in News on 17 April 2019 by Henry & Bricogne. 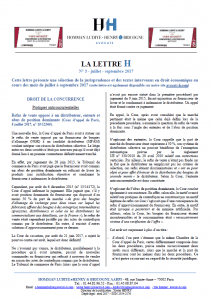 Letter H n° 11 – Current economic law – February / March 2019 –Newsletter of the law firm Henry & Bricogne. This entry was posted in News on 11 April 2019 by Henry & Bricogne. Our law firm is once again listed in 2019 in Best Law Firm ranking established by Décideurs Magazine in Antitrust and Anti-Competitive Practices as well as Distribution Law and Restrictive Practices. It is also this year in the commercial litigation ranking. This entry was posted in News on 3 April 2019 by Henry & Bricogne. 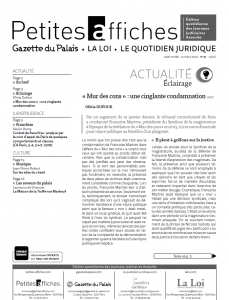 Publication of an article written by Xavier Henry in the legal journal Les Petites Affiches of March 12, 2019 about a judgment rendered by the Court of Appeal of Paris on October 3, 2018 entitled “Franchise Agreement: analysis by the court of Paris of several behaviors and clauses” (LPA 12 March 2019, n ° 51, article n ° 142n8, p.5). According to a judgment dated 3 October 2018, the Court of Appeal of Paris had to settle a dispute between a franchisor and a franchisee in the field of mass distribution which leads the court to examine several aspects of the franchisor / franchisee relationship such as the franchisee’s economic dependence vis-à-vis its franchisor, the practice of prices between the parties or the post-contractual non-competition clause. The answers given by the court on these various questions make it possible to broaden the legal analysis of relations between franchisors and franchisees and more generally between suppliers and distributors. This entry was posted in News on 15 March 2019 by Henry & Bricogne. 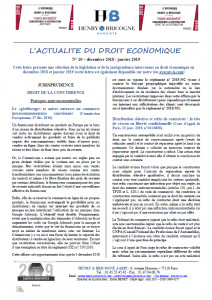 Letter H n° 10 – Current economic law – December 2018 / January 2019 –Newsletter of the law firm Henry & Bricogne. This entry was posted in News on 21 February 2019 by Henry & Bricogne. 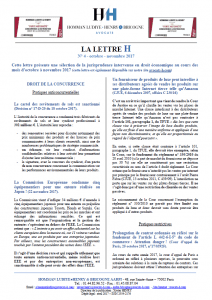 Autoactu.com comments the decision of the Paris Court of Appeal dated 23 January 2019 which confirms the car manufacturer’s right to refuse to contract opposed to a authorized repairer candidate. The car manufacturer was represented by our firm. 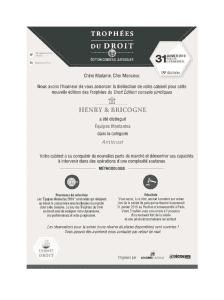 This entry was posted in News on 13 February 2019 by Henry & Bricogne. 31 January 2019. 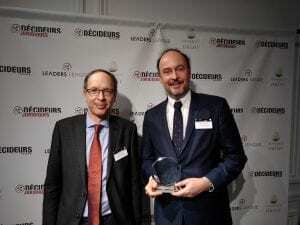 Law Awards ceremony organized by Décideurs Magazine: our firm received an Award in the rising team antitrust category. This entry was posted in News on 1 February 2019 by Henry & Bricogne. 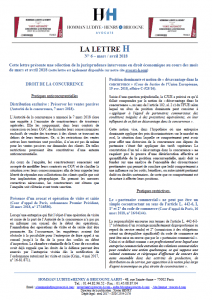 Selective distribution: validity of a refusal to contract opposed by a car manufacturer to a former repairer (Paris Court of Appeal, January 23, 2019, n ° 16/16856). By a judgment of 23 January 2019, the Paris Court of Appeal ruled that a car manufacturer represented by our firm was entitled to refuse to contract with a former repairer whose contract had been terminated with a two years’ notice since the refusal to contract did not have an anti-competitive object or effect. The former repairer argued that because he fulfilled the qualitative standards of selection, he had to be approved again. This argument is rejected. The car manufacturer does not infringe the competition rules by not contracting with him. The manufacturer simply did not want to renew a partnership which did not satisfy him. The Court adds that, regarding competition on the car aftermarket, refusing to contract with a repairer candidate cannot have an effect on the market. The car manufacturer has therefore not committed any anti-competitive practice. It must therefore be understood from this judgment that a manufacturer may not have to contract again with a former repairer whose contract was terminated with a two years’ notice even if he fulfills the qualitative standards of selection (Arrêt Mazda CA Paris 19.01.23). This entry was posted in News on 25 January 2019 by Henry & Bricogne. January 16, 2019. Publication on the Justice Village website of a legal article written by Xavier Henry entitled “Franchise contract: pre-contractual information is still in the case law events”. Although the provisions relating to the pre-contractual information that must be provided before signing a franchise contract in particular are not recent since they derive from the Act n° 89-1008 dated 31 December 1989 known as ” Doubin Act “and decree n° 91-337 dated 4 April 1991, they continue to generate plentiful case law. This entry was posted in News on 17 January 2019 by Henry & Bricogne. Our firm is distinguished as the rising team in the antitrust category by Décideurs magazine and will receive this distinction at the Law Awards ceremony on January 31, 2019. We would like to thank all our clients for their trust because of course this distinction is in large part due to them. This entry was posted in News on 9 January 2019 by Henry & Bricogne. January 7, 2019. 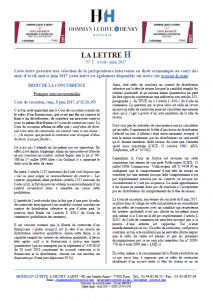 The DGCCRF (French Directorate General for Competition, Consumer Affairs and Prevention of Fraud) submits to professionals for opinion the proposed changes of the Commercial Code regarding in particular invoicing and single agreement (“convention unique”). These amendments will then be subject to legal provisions in accordance with the EGALIM Act of October 30, 2018. With regard to invoicing: the invoice must be issued as soon as the delivery and no longer upon the completion of the sale. as regards the single agreement, different cases are envisaged depending on whether or not the agreement concerns consumer products (“produits de grande consommation”) which are defined by the DGCCRF in its comments. When it does not cover such products, the conditions are less restrictive. There is no longer a deadline for concluding it because it is up to the parties to determine this date (the date of March 1, however, is maintained for single agreements concerning wholesalers). In the case of consumer products, the proposed amendments are more rigid ( forecast turnover, imperative date of conclusion which is no longer however necessarily that of March 1, no possibility for derogations, …). Article L. 442-6 of the Commercial Code (significant imbalance, sudden termination of commercial relations, etc.) is not concerned and will be subject to subsequent proposals. Comments must be sent by 21 January 2019 at the latest. 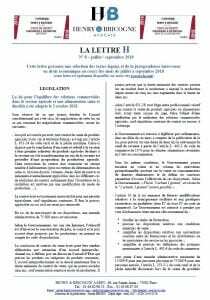 The bill will be submitted to the Conseil d’Etat (State Council) at the end of February 2019. This entry was posted in News on 7 January 2019 by Henry & Bricogne. This entry was posted in News on 10 December 2018 by Henry & Bricogne. This entry was posted in News on 18 October 2018 by Henry & Bricogne. This entry was posted in News on 3 October 2018 by Henry & Bricogne. 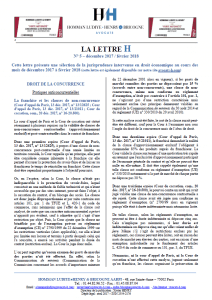 Publication in September 2018 of an article written by André Bricogne on the Village de la Justice website about the Court of Appeal of Paris’ decision dated 12 September 2018, n° n°15/15234 and entitled “Termination of a distribution contract: The injury assessment according to the legal basis of the claim” (village-justice.com, 20 September 2018). The economic reconversion of the business partner victim of a contractual termination will be, or will not be, taken into account to assess the reparable damage according to whether the claim for damages is brought on a contractual or tortious basis. This entry was posted in News on 21 September 2018 by Henry & Bricogne. Publication in September 2018 of an article written by Xavier Henry in the legal Journal Dalloz Actualité Juridique Contrat entitled “Abusive clauses in commercial contracts: inventory of the situation ten years later” (Dalloz AJ Contrat – August-September 2018 – n° 8-9, p. 370). The modernization of the economy law dated 4 August 2008 added in Article L. 442-6, I, 2 ° of the French Commercial Code a new case of responsibility prohibiting the fact of “submit or attempt to submit a trading partner obligations creating a significant imbalance in the rights and obligations of the parties “. The legislator thus wanted to extend to commercial contracts the prohibition of unfair clauses previously reserved for contracts between consumers and professionals. If Article L. 442-6, I, 2 ° does not constitute the revolution expected by some and dreaded by others, it nonetheless poses a general principle that simplifies the challenge of clauses not only by the weak party of the relationship but also by the Minister of the Economy. Ten years after its adoption, an inventory of case law is needed, the text having obviously raised questions that have not all received a clear answer. 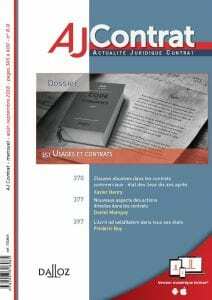 Abusive clauses in commercial contracts – Inventory of the situation ten years later -Dalloz AJ Contrat – August-September 2018 – n° 8-9, p. 370. This entry was posted in News on 14 September 2018 by Henry & Bricogne. 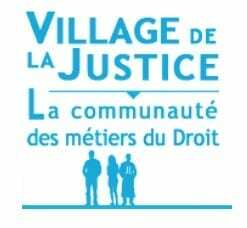 Publication in September 2018 of an article written by our law firm on the Village de la Justice website about recent case law in economic law (Chronique sélective de la Jurisprudence rendue en droit économique, village-justice.com, 12 September 2018). In particular, with regard to competition law, the European Commission has highly fined a search engine for abuse of dominant position and the Paris Court of Appeal has in general upheld the fines imposed by the French Competition Authority in the courier and parcels cartel . The Court of Appeal of Paris handed down various interesting decisions on the unfair (imbalanced) commercial clauses, on the disproportion of an advantage granted with regard to its value (subject rarely dealt with in case law), on the sudden termination of established relations, on unfair competition and parasitism. Regarding distribution law, Courts have been led to decide the validity of the pre-contractual information document imposed by Article L. 330-3 of the French Commercial Code, on certain contractual clauses such as purchase commitments or on the principles of calculation of the compensation due to the commercial agent in case of termination of his contract. 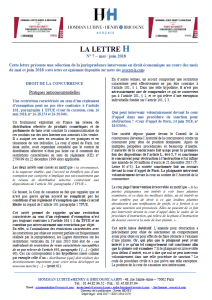 Finally, regarding consumer law, the French Supreme Court (Cour de cassation) ruled on the legal guarantee of conformity. This entry was posted in News on 12 September 2018 by Henry & Bricogne. 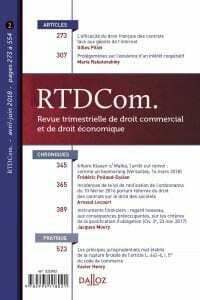 Publication in July 2018 of an article by Xavier Henry in the Quarterly Review of Commercial Law and Economic Law (RTDCom), Editions Dalloz, entitled “The ill-established case-law principles of Article L. 442-6, I, 5 ° of the commercial code ” (RTDCom, April-June 2018, p. 523). 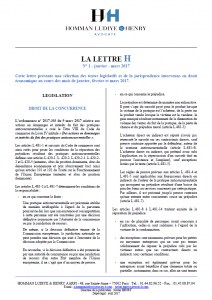 If the merits of Article L. 442-6, I, 5 ° of the French Commercial Code which requires, before terminating an established commercial relationship, to give written notice to the co-contracting party, are not disputed, its application makes debate. 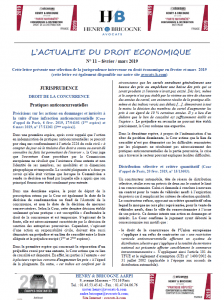 The Commercial Chamber of the French Supreme Court (Cour de cassation) has made this text a special category of civil liability, asserting in particular its tort nature although the parties were bound by one or more contracts (written or not). Above all, it created a new principle in French law: compensation without proof of harm. The case law is often disconcerting, which increases the legal uncertainty for companies which have to deal with new rules that it was hardly possible to anticipate such as the questioning of the resolutive clauses. However, an application of well-known legal principles would not diminish the effectiveness of the text and would provide greater legal certainty. This entry was posted in News on 28 July 2018 by Henry & Bricogne. This entry was posted in News on 17 July 2018 by Henry & Bricogne. This entry was posted in News on 17 May 2018 by Henry & Bricogne. Our law firm is once again listed in 2018 in Best Law Firm ranking established by Décideurs Magazine in Antitrust and Anti-Competitive Practices as well as Distribution Law and Restrictive Practices. This entry was posted in News on 9 April 2018 by Henry & Bricogne. 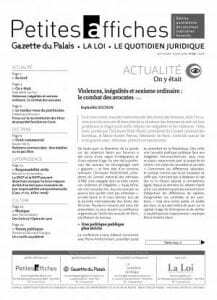 Legal article written by Xavier Henry published in the legal journal Les Petites Affiches dated April 6, 2018 entitled “Business relationships : to be established or not to be” (LPA 6 April 2018, n° 70, article n° 134h3, p. 9). It presents thoughts about what are or should be “established” business relationships under Article L. 442-6, I, 5° of the French Commercial Code which prohibits abrupt termination of established business relationships. 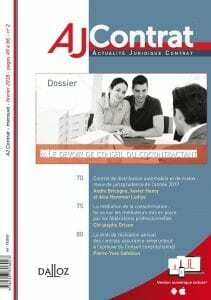 Legal article written by our law firm published in the legal journal Dalloz Actualité Juridique Contrat of February 2018: “Motor vehicles and motorcycles contract: review of jurisprudence of the year 2017” (Dallloz AJ Contrat, February 2018, n° 2, p. 70). Automotive distribution, given its economic dimension in France and uses or habits resulting from successive specific exemption regulations, generates numerous and sometimes specific cases. 2017 did not depart from this rule. Whether it is the selection of distributors, the performance of contracts or their termination, 2017 knew very interesting judgments. Motorcycles distribution, even if litigation is lower, completes this panorama of case law. This entry was posted in News on 12 March 2018 by Henry & Bricogne. This entry was posted in News on 8 December 2017 by Henry & Bricogne. This entry was posted in News on 6 October 2017 by Henry & Bricogne. Our law firm is listed in the 2017 Best Law Firm ranking established by Décideurs Magazine in Antitrust and Anti-Competitive Practices as well as Distribution Law and Restrictive Practices. This entry was posted in News on 11 July 2017 by Henry & Bricogne. This entry was posted in News on 11 May 2017 by jblalangue. Xavier Henry and André Bricogne have been lawyers at the Paris Bar since 1992 and 1997 respectively. They have always been active in business law and especially in economic law. Having worked together in the same firm for some years, they have decided to continue their practice within their own business law structure (advice, litigation, training). With it, they can maintain a close and direct relationship with their clients and offer them a service that match their requests and needs in the firm’s areas of expertise of which they have perfect command. Xavier Henry and André Bricogne are both AFEC’s members (French Association for Competition Study).